UNDER THE GUN (9/23/86) . ****-flawless introduction to Sledge, Dori and Trunk. The pilot sets the tone perfectly with Spencer really going for broke with his script and director Martha Coolidge nailing the numerous sight gags. John Vernon is on hand to play the mayor who personally requests that Hammer be taken of suspension and given the assignment of locating his kidnapped daughter. It's a shame Vernon never got to reprise the role; hes deadpan great. The sorter version (eliminating the interrogation scene with recurring stoolie Don Stark as Kurt Krugle) actually flows better than the DVD version. HAMMER GETS NAILED (9/26/86) Guest star Ronnie Schell as a hard-nosed investigative reporter, who can make or break the department's budget when he requests to ride with the cops for a day. Guess who gets the assignment? Sledge's sensitive side emerges when he's confronted with a hungry criminal, and----nah, I can't keep a straight face and finish that thought. *** Some classic moments in this one, but Schell isn't one of the more memorable guests. WITLESS (10/3/86) With a mafia contract out on his life, Hammer is ordered "far away from the city". ***1/2 Arguably Spencer's funniest script, works brilliantly despite some of the more obvious network censorship. Al Ruscio's Godfather shtick is put to very good use. THEY SHOOT HAMMERS, DON'T THEY? (10/17/86) Guest star Jack Thibeau (ESCAPE FROM ALCATRAZ) is Hammer's old partner, who has broken out of prison and is spoiling for a showdown. The first episode to explore Sledge's background and tell us a little about his father, the late Jack Hammer. ***1/2 Thibeau's outrageously over the top performance puts this episode in the winner's circle. In addition to providing us with comedy gold, the psychotic character makes Hammer seem positively normal. DORI DAY AFTERNOON (10/24/86) Sledge and Dori are taken hostage in a bank holdup. Attica! Attica! **1/2 Great opening gag, but pretty routine the rest of the way. TO SLEDGE WITH LOVE (10/31/86) Sledge tries his own version of "Scared Straight" with some juvenile delinquents. *1/2 The first real clunker, with long stretches in between solid laughs. ALL SHOOK UP (11/7/86) A serial killer is targeting Elvis impersonators, so Hammer decides to put on his blue swede shoes and go undercover. **** Alan Spencer wrote this one in tribute to his late friend Andy Kaufman, and created one of the best-loved and well remembered episodes. Deservedly so: inspired lunacy from start to finish. OVER MY DEAD BODYGUARD (11/14/86) It's up to Sledge to protect mafia witness Captain Trunk, who has the added dilemna of a reconciliation with his ex-wife. ** Interesting to learn a little about the Captain's personal life, and guest star Tracy Reed (...ALL THE MARBLES) is always a welcome presence, but this is one of the less memorable episodes from a comedic standpoint. MAGNUM FARCE (11/22/86) You knew it was only a matter of time before Hammer and friends gave us their take on the second Dirty Harry film, with David Leisure among the vigilantes. *** Fine spoof of the plot and politics of the original, right down to the identity of the vigilantes' leader. IF I HAD A LITTLE HAMMER (11/29/86) "I deal in scumsuckers, not thumbsuckers!" Despite his protests, Dori gets the two of them assigned to a case involving babies being kidnapped for the black market. **1/2 Sledge + babies = more wonderfully outrageous un-PC humor. TO LIVE AND DIE ON T.V. (12/13/86) Peter Marshall is a game show host who resorts to murder when a contestant gets uncomfortably close to a million dollar prize he can't pay off. **1/2 Very funny, but the forced change to a local, rather than network, show dilutes some of the intended edge. Censorship ended up hurting this one. MISS OF THE SPIDER WOMAN (12/20/86) Hammer has 11 hours to find the antidote after being poisoned. ** Your one chance to see Hammer and Doreau at a mud wrestling match. THE OLD MAN AND THE SLEDGE (1/3/87) Stephen Elliot plays Sledge's aging idol, who wishes to prove he can still cut it at age 72. ***1/2 Surprisingly genuine heart combined with side-splittingly un-PC humor; one of the season's best. STATE OF SLEDGE (1/10/87) Sledge brings in the leader of a Satanic cult at the same time a by-the-book internal affairs officer reviews Hammer's file (brought in via wheelbarrow) **** Terrific script by Al Jean and Mike Reiss with some fine insight provided with the comedy. One joke after another hits the bulls-eye, and interestingly, validity is given at various times to both Hammer's P.O.V. and the I.A. officer's as well. The series had really hit its stride by this time. This was the first episode to air without the laugh track ABC initially imposed. 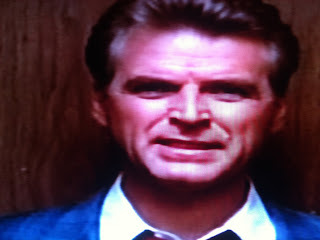 HAVEN'T GUN WILL TRAVEL (1/17/87) What happens when Sledge Hammer loses his prized gun? **** Non-stop hilarity in this winner. Kopell would return in Season Two for another great entry, LAST OF THE RED HOT VAMPIRES. THE COLOR OF HAMMER (1/24/87) Sledge's favorite hanging judge turns up murdered. ***1/2 Lots of expected slapstick and cliche-busting; I know, that's par for the course but some extra rapid-fire laughs here. In a series known for great guest stars, an extra half-star for gorgeous Bond girl Martine Beswick's comic turn. BROTHER CAN YOU SPARE A CRIME? (1/31/87) Sledge's brother turns up out of nowhere, and proves to be the polar opposite of the Inspector, a ne'er-do-well with the ability to charm just about anyone. **1/2 Decent enough, but not as sharp as it seems it should be. 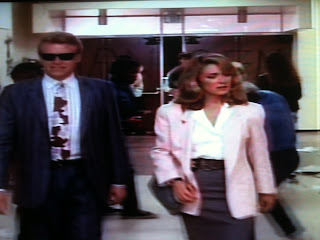 DESPERATELY SEEKING DORI (2/7/87) Dori emerges from a concussion acting and dressing exactly like Hammer, hampering their efforts to crack a counterfeiting ring. **1/2 Lots of the obvious here, which is amusing but doesn't reach the high gear of other episodes. SLEDGEPOO (2/14/87) Scotland Yard and Kurt Kruggle help Sledge crack a cat burgling case. **1/2 Sledge's new hairdo is the funniest thing here. Rasche's knack for accents comes in handy yet again. COMRADE HAMMER (2/21/87) Spencer and company had to get around to a Cold War episode sooner or later, and combine it with a trip to the Hitchcockian. *** Nicely done. The series would return to Hitchcock land in Season Two with the arguably better "Vertical". JAGGED SLEDGE (4/21/87) Hammer's on trial for murdering a mobster, and after firing his crooked attorney ends up defending himself--literally. *** Sledge in a courtroom was a frequent occurrence, and our favorite rogue generally delivered the goods there. The season's penultimate episode is no exception. THE SPA WHO LOVED ME (4/28/87) . **** Lived up to the hype, and kept people talking about the show all summer back in '87. But you could take away the climax and you'd still have one riotous episode. Sledge Hammer! was one of the best shows ever on television!! !